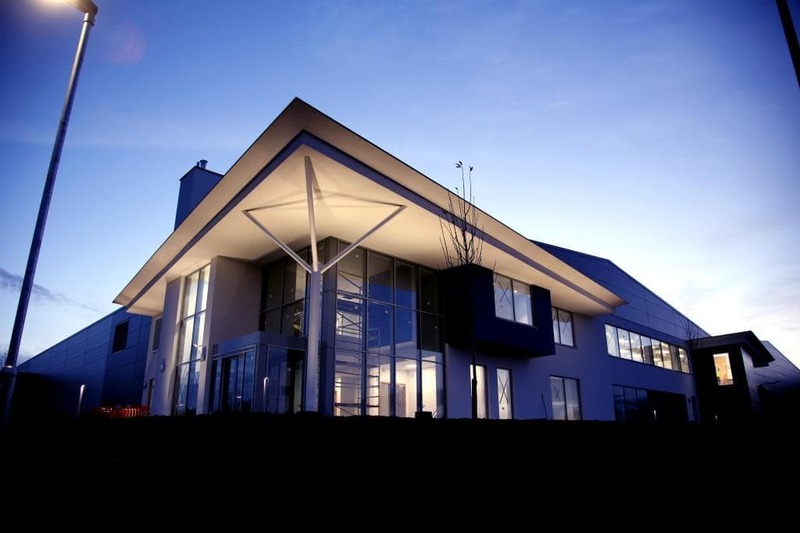 RLC Global Point is a new, state of the art world-class manufacturing facility for the RLC group, located at Global Point Business Park in Newtownabbey. The company makes components for some of the best-known names in the aerospace sector, including Martin Baker and Rolls-Royce and the new facility provides over 110,000sq. ft of bespoke manufacturing space with office provisions (RLC will also use it as the base for a research and development project focusing on engine components). The project represents a major investment in Northern Ireland which clearly demonstrates to the international aerospace community that the region represents a strategic location for providing advanced manufacturing and engineering solutions. The new RLC manufacturing facility comprises of a structural steel framed building with specialised Kingspan hook on cladding systems with integrated curtain walling and roof light systems to direct natural daylighting into the internal Warehouse and accommodation areas. It includes a full height storage racking in-rack sprinkler system, gas suppression overhead gantry crane, and internal compartmentation with class 100 cleanroom facility for research and development. Administration areas allow for 29 desk spaces with a no. of cellular offices, meeting rooms, training room and ancillary accommodation including canteen and print room linked with a 12-person passenger lift. The facility features exceptionally high levels of servicing including General Purpose Power, General & Emergency Lighting with Digital Dimming, Induction Loop, Staff Call System, CCTV, Magnetic Door Locking Systems, Lightning Protection, Automatic Door Entry, Wiring, Cat 5e Structured Cabling, Addressable Fire Alarm System, Disabled refuge System, TV Aerial System, Access Controls and Plant Room Wiring all controlled by a sophisticated BMS System. The external works included provision of 124 car parking spaces with permeable paving solution to eliminate surface water drainage and creation of two entrances, one for visitors and staff parking to the front and a heavy vehicle goods access at the rear with main carriageway sight line realignment works. The global aerospace sector is a dynamic one providing advanced manufacturing and engineering solutions and a key requirement of the project is for the facility to meet the demands of the aerospace industry therefore we recognised that Projects of this nature have their own complexities and constraints, from our initial anchor workshop it was clear that the key project driver was delivery within completion date with Zero defects at handover. To achieve this we allocated a full time Project Planner and Quality Manager to the team to ensure all aspects of our integrated project procedures were implemented. We developed a fully integrated design, construction and commissioning programme, following a systematic process of communication and planning. It identified the dates required for shutdown of facilities operations and we used this shutdown to simultaneously connect all services to existing RLC Network systems (i.e. data fibrotic, life-safety and alarm systems to link all RLC facilities to their main network hub). The structural steel frame contained large, clear spans above the form the building envelope warehouse area, containing approx. 450 Tonne of structural steel and was extremely complex due to the height, spans and location. This element of this project was modelled and detailed using Tekla which was imported into a 3D models and subsequently used for co-ordination of building elements and clash detection.